Over the last few years the move to the cloud has gone from a trickle to a deluge. There have been a couple of cloud-based resources that I’ve come across in the course of teaching coding over the last few months that seem to me to be pushing the boundaries of this movement in the best possible way. 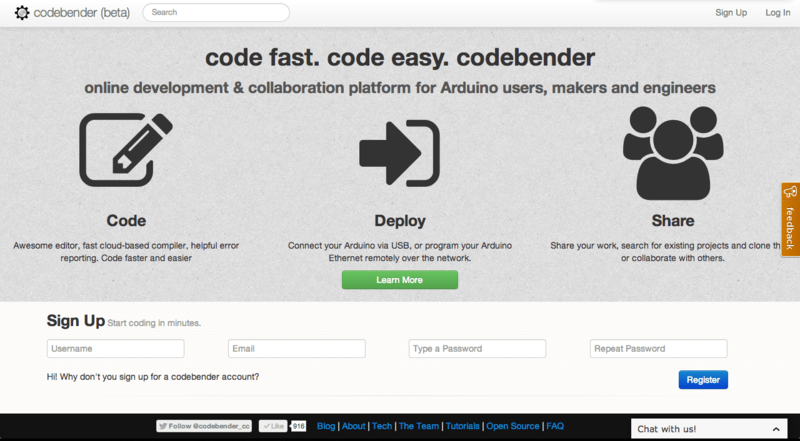 Codebender is an online Arduino IDE which makes working with the Ardiuno extraordinarily easy. It’s web-based but completely full-featured including built-in libraries, code highlighting and documentation. And, of course, you can upload to any of the multitude of Arduino types. The fact that it’s web-based has some obvious advantages – sharing you code with others, working on it from anywhere. It also has one big advantage in a school context – it doesn’t require installation with all its attendant restrictions. The cherry on the cake is that Codebender is much more user-friendly than the standard Arduino software. Cloud9 has a tag-line that is: ‘it’s like Google Docs for code’. That sums up both services perfectly. They work well, they look good, and they don’t require any installation: this is the 21st Century in action. Both Cloud9 and Codebender are free (Cloud9 also has paid-for upgrade options not needed in a school context, but helpful in a commercial context).